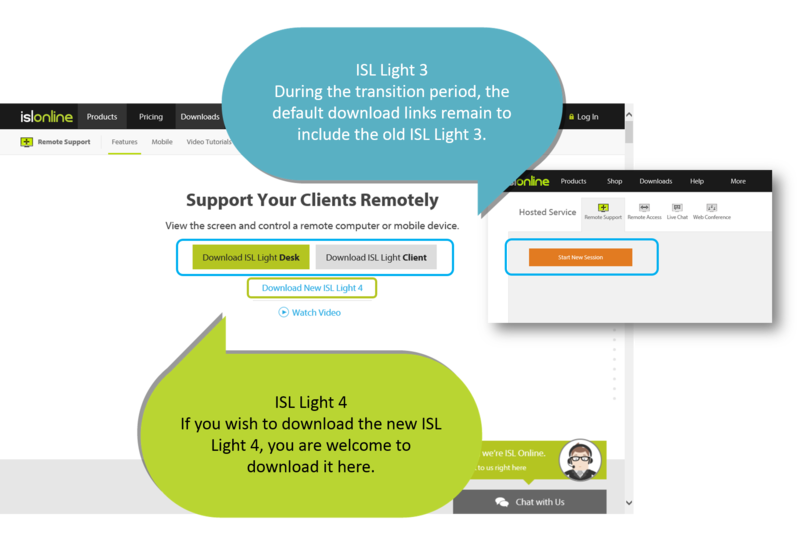 Tweet this: Meet ISL Light 4 – a powerful remote support solution. Great desktop sharing, ultrafast connections, seamless design http://goo.gl/Ium552. Presenting a new generation remote desktop support solution. ISL Light 4 is powerful, yet simple. Robust, yet effortless. Elegant, yet efficient. Above all, it gets you things done quicker and easier. Launched in 2003 as one of the early remote desktop solutions on the market, ISL Light today empowers more than 200,000 SME and large support centres worldwide to efficiently assist remote computers with IT issues. Today, we are proud to introduce an even more powerful IT support solution with great desktop sharing, ultrafast connections and a seamless design. Meet ISL Light 4. First up, here’s an overview of what’s new in ISL Light 4. Easy connection in amazing 2 seconds. ISL Light 4 lets you securely connect to a remote computer in mind-boggling 2 seconds, provided you have a normal Internet connection. How? The helpdesk operator runs ISL Light 4, logs in, starts a new session and invites a remote client to join it. When the client confirms the invitation, the countdown begins: 2, 1, connected! The client’s desktop pops up on the operator’s screen with remote control already active. Here is a look at how fast you connect with ISL Light 4. Installation of the new app or using it as a thin client. Upon downloading ISL Light 4, you can either install it and make a shortcut on your desktop or pin it to the taskbar. Anyway, if you prefer the old way, you can still keep using the remote desktop application as a thin client and just run it whenever needed without an installation. Getting remote system information by a push of a button. Once connected, the first thing a supporter troubleshooting a remote computer will probably need is a quick overview of its hardware and software. 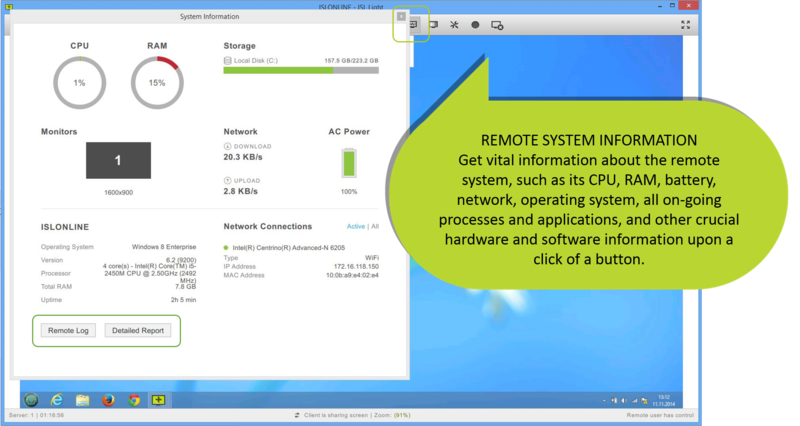 The system information window, now designed in appealing graphics, will provide you with a quick snapshot of the CPU, memory, storage, monitors, network and network connections, and, what’s more, it will provide you with even more details of the remote computer if requested (‘Detailed Report’). Easy control of a remote computer with the redesigned interface. The completely revamped ISL Light 4 is now slimmer as it has merged the helpdesk with the remote desktop window into one with all remote assistance commands now intuitively organised above the shared desktop. Please see the picture gallery to get to know the new interface. The best screen sharing so far. ISL Light 4 will provide clear, fast and smooth screen sharing, whether you’re servicing another computer on the same local network, or you’re halfway around the world. The largely optimised proprietary Internet Screen Sharing Codec (ISSC) in fact produces the best quality and highest speed remote desktop share so far. Dashboard for managing multiple sessions. To improve productivity, helpdesk operators can now easily assist multiple remote computers at the same time. The new dashboard enables you to add more troubleshooting sessions, toggle between them and transfer a session to a more appropriate operator. Moreover, it lets you enable permanent remote access to computers intended for continuous service in the future, edit settings etc. Computers on which you have installed ISL Light’s sister program for remote access, ISL AlwaysOn, have been moved to ISL Light 4 and are now conveniently listed in a separate tab. Feel free to access these remote computers from anywhere without the help of a remote user. 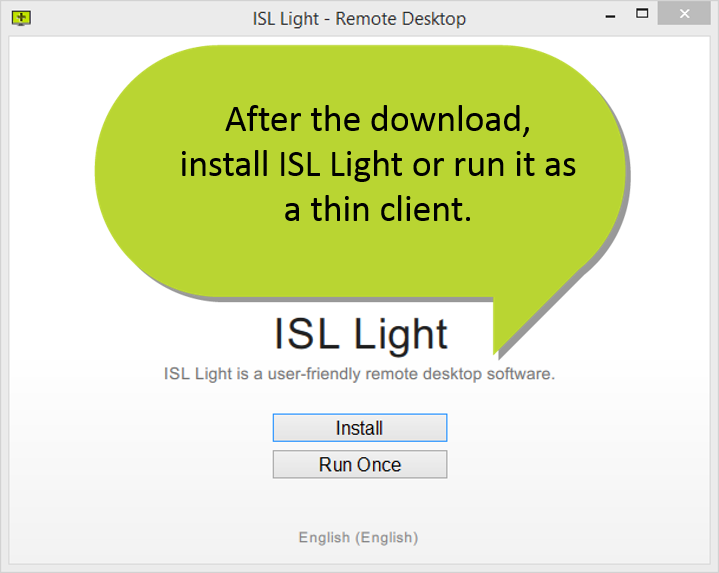 ISL Light 4 is supported on Microsoft Windows 7 or later and Mac OS X 10.6 or later. It is also supported on older Microsoft systems (Vista and later) with an installed DirectX 9 or later (manual download required). The end-user part, ISL Light Client 4, when released, will be widely supported on other operating systems as well. Significant improvement for Mac OS X. More good news for Mac users! Since ISL Light 4 is based on a totally new architecture in order to unify the software development for Windows and Mac OS, the future updates and new features will be developed simultaneously for both platforms. In practice, whatever Windows users are getting, so are the Mac users, beginning with ISL Light 4. Try new remote desktop ISL Light 4 on your Mac. Companies around the world have chosen ISL Light as their remote support standard. See how Konica Minolta and other organisations have deployed ISL Light and empowered their helpdesk operators for optimal productivity. Read case studies. Remote clients should continue using ISL Light Client 3. As ISL Light Client 4, a new version for end-users, hasn’t been released yet, you can assure your clients it’s best to use the existing application ISL Light Client 3 through www.islonline.com/join or otherwise. However, a new client application is currently in its final stages of development and as such available for testing. 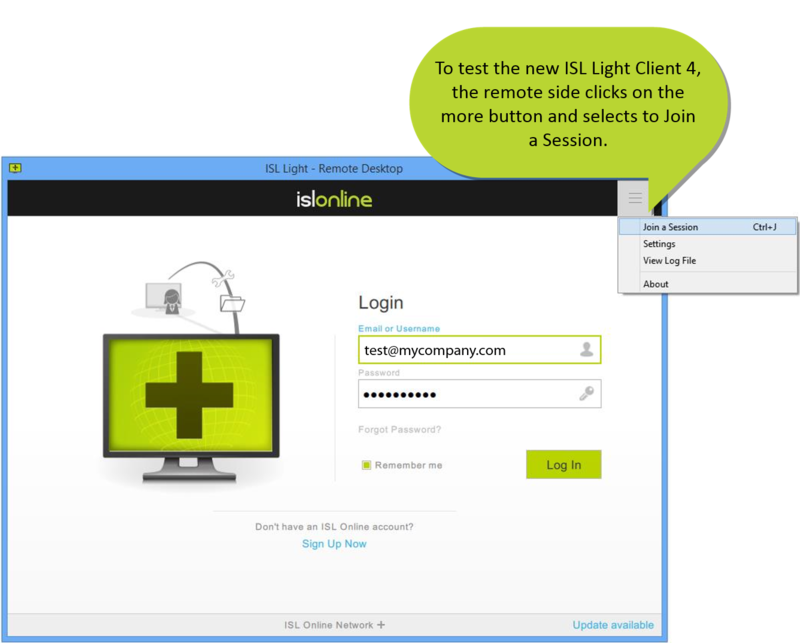 To see ISL Light Client 4’s progress, you can open the app by running ISL Light 4, clicking on more options and selecting ‘Join a Session’. We realize that more than 200,000 businesses worldwide depend on ISL Light for secure remote support, efficient computer troubleshooting and problem resolution over the Internet. As the fourth-generation software, ISL Light, 4 significantly differs from the current version in use, we are planning a short transition period as to give everyone enough time to adjust. During this period, the default download links will remain the same, running ISL Light 3 instead of the latest version 4. Nevertheless, a download ISL Light 4 link has been added right next to the default download links and you are welcome to start using it. After the transition period of a few weeks, ISL Light 4 will be set as the default download link. So, stay tuned! 1. Make sure your ISL Conference Proxy server is fully updated. This way you can be sure that ISL Light 4 has been added to your server’s list of programs. This entry was posted in corporate remote desktop, desktop sharing, ISL Light, isl online, Redesign, remote access, remote desktop, remote desktop support, Remote support, Uncategorized and tagged business remote support, new remote desktop, remote access, remote access for mac, remote support. Bookmark the permalink.